Size - 85 servings per package, 9 oz. How to Use - As a super-food supplement, mix 1 or 2 heaping teaspoons or more with 8 to 10 ounces of water, juice, or soup for ALL DAY ENERGY and you can dispense with all of the capsules and tablets you take in order to be healthy. Drink anytime or use as directed by your doctor or health professional. You can also add the V21 to soup as the healthy measure or sprinkle it on salads or mixed with olive oil and apple-cider vinegar. Every Vitamin and Mineral needed by a human being is present in V21 including gold, silver, iodine, zinc manganese and all trace elements. Your minerals are not present in great amounts in the vegetables and fruits that you eat. Unless you grow them yourself, they are grown commercially in soils that have been depleted of mineral content for more than a century by continually planting in the same soil without replenishing the minerals. Fertilizers only contain NPK (Nitrogen-Phosphorus-Potassium) so the plants cannot supply you with the minerals you need for more perfect health. 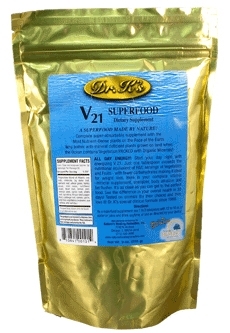 But Dr. K's V21 is made with organically grown and harvested plants, especially plants from the ocean. YES, THE OCEAN, THAT IS WHERE ALL THE MINERALS ARE. Ocean plants are packed full of energizing and healing chlorophyll and are INCREDIBLY dense with ORGANIC VITAMINS AND MINERALS. The plants that contain the MOST minerals come from the ocean, not the land. The unique powerful blend of plants in V21 contain everything you need to maintain a more perfect health. Does it help your digestion? You Bet! It's as close as you can get to the PERFECT FOOD. Why take vitamins and minerals manufactured in some factory when you can get ORGANIC vitamins and minerals manufactured by Nature/God, the master pharmacist. Ounce for ounce you can't beat it. Forget the rest. Take the best! V21 works almost immediately. Since it is a liquid there is no need for a lot of digestion. It goes into the small intestine and then directly into the bloodstream for immediate absorption. It rebalances the acid-base system and helps protect against disease. 99 percent of the V21 vitamins and minerals are absorbable and works synergistically to improve your health. Dr. K's V21 contains every mineral and vitamin needed by the body and is carefully formulated in the right proportions. It's as close as you can get to the perfect food and it tastes good too. If you find it to be spicy, know that the special Cayenne (African Bird Pepper) and Garlic are added because you need these important herbs for better health. These two herbs are stated by many to be among the most important in the world. Add the V21 to soup as the healthy measure or sprinkle it on salads or mixed with olive oil and apple-cider vinegar. See the difference in your health in 30 days! Improves energy and appetite in weakened individuals and the elderly. Helps with weight loss and nutritional deficiencies. It's your gift from the ocean! Tested on animals (by their choice) and they love it! Dr. K's special formula since 1988.